Need a monitor to go with your new £1,500 graphics card? 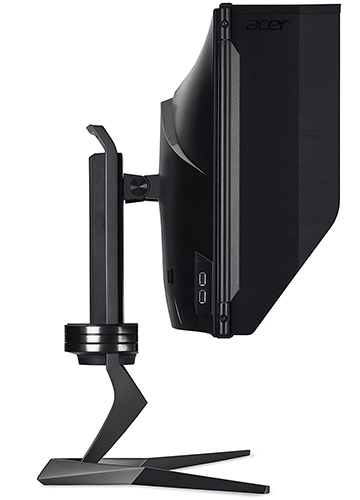 You're probably going to want something equally extreme, and one of the first panels to spring to mind is the Acer Predator X27. Priced at £1,800, this 27in display promises to deliver gaming nirvana courtesy of a 4K resolution, 144Hz refresh rate and support for Nvidia G-Sync HDR. The specification alone would convince most enthusiasts to reach for their wallet, but as is often the case with high-end gaming gear, there are one or two provisos to consider. We've spent the past fortnight exploring the Predator X27's pros and cons, and we're now ready to share some thoughts. What makes the Predator X27 tick is an IPS panel from AU Optronics. Offering a 3,840x2,160 resolution, it touts not only 4K credentials but also a whole host of top-notch features. Ready for it? Here it is: 144Hz refresh rate, 178º viewing angles, a 4ms GTG response time, brightness of up to 600 cd/m², 10-bit colour, support for Nvidia G-Sync (30-144Hz), 384 individual dimming zones and one of the best HDR experiences we've seen on a PC monitor to date. Plenty there to justify the expense, and truth be told, you do notice all that goodness when you're engrossed in your favourite game. Brightness is impressive, out-the-box colour accuracy is tremendous, the G-Sync implementation is so good that you don't pay any attention to it - tearing is practically eliminated to leave a silky-smooth image - and the panel is DisplayHDR 1000 certified. Granted, Windows still doesn't look quite right to our eye with HDR enabled, but the best-in-class certification means that Predator X27 is capable of flash brightness of at least 1,000 nits, long-duration brightness of at least 600 nits, blacks as deep as 0.05 nits, and 10-bit colour, achieved by using 8-bit drivers and frame-rate control dithering. In short, play true HDR content and you're in for a visual treat. On paper, it's easy to see why the panel has caused a stir, but we often state that the monitor landscape has evolved in such a way that it is almost impossible to achieve excellence in all regards. Predator X27 is in some ways the perfect example of that theory, as while it impresses in so many aspects, it also has the ability to frustrate. One such example is the bandwith constraint of DisplayPort 1.4, which means that while the monitor can do 4K at up to 144Hz, it will need to reduce chroma subsampling to 4:2:2 in order to run at the highest speed. Achieving maximum 4:4:4 quality at 4K requires dropping down to a 98Hz refresh rate. The biggest visual issue, in our estimation, is the dreaded halo effect. 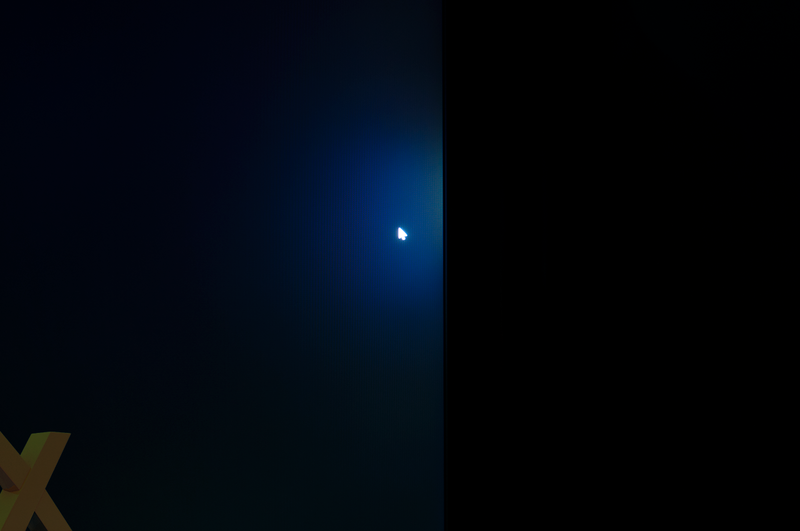 Acer's use of full-array local dimming (FALD) works wonders for maximising the HDR effect, but it also creates an undesirable glow when bright objects are placed on a dark background. It is an unfortunate by-product of the technology, but are you going to notice it to such an extent that it may hamper the day-to-day experience? That depends on what you'll be doing most of the time. When working with regular desktop apps, the halo effect can be bothersome - it's hard to ignore when you know it's there - but it is far less apparent when gaming. Is there another potential question-mark hanging over the screen size? Cost-per-inch obviously isn't favourable, yet while we might have preferred a 32in panel at this resolution, 3,840x2,160 works fine at 27in if you increase Windows 10 scaling to 150 per cent. 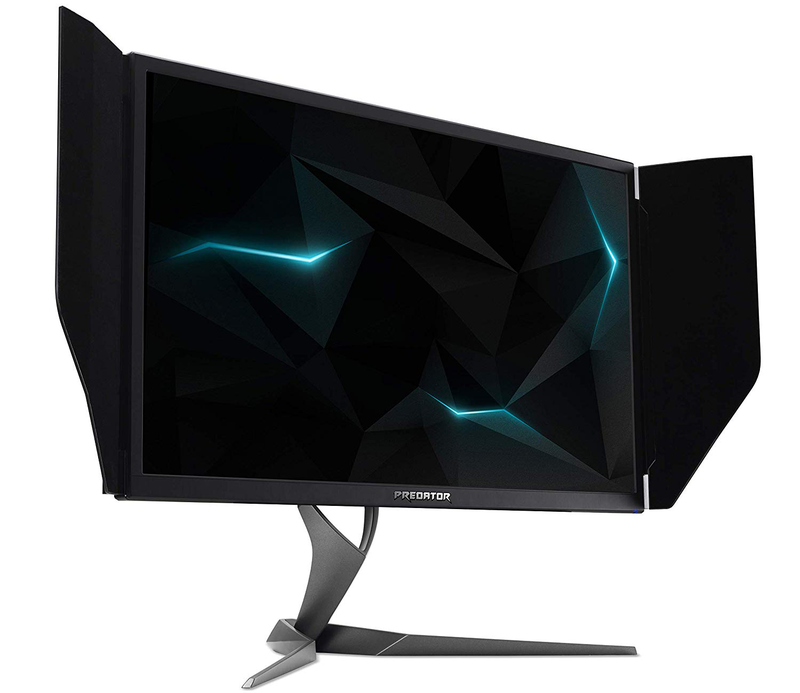 It is also worth noting that Predator X27 isn't a 144Hz panel out of the box - it needs to be manually overclocked via the OSD from 120Hz to 144Hz - and for competitive gamers, there's also no getting around the fact that this IPS panel won't be as responsive as cheaper TN alternatives. 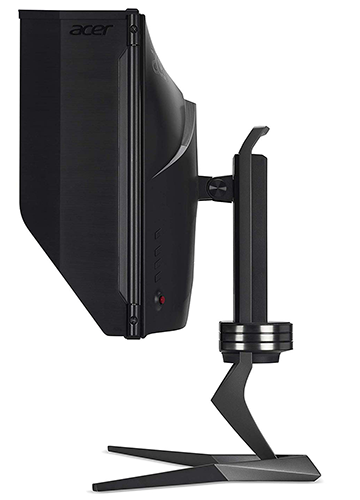 It's a limitation that's inherent to the technology, and if you really feel the difference between a 1ms and 4ms response time, this £1,800 solution just won't cut it. All the aforementioned niggles serve to reinforce our opinion that the leading monitor technologies of today are all hamstrung in one way or another. Even at this price point, the IPS-based Predator X27 has its flaws, but from an eye-candy perspective, the few gripes are overshadowed by a jaw-dropping image that really comes to life when gaming. A dazzling panel is the star of the show, but we also need to talk about Acer's presentation. 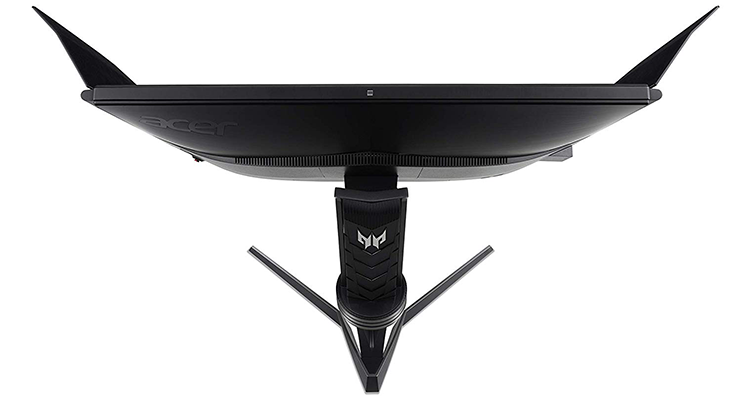 Gaming monitors tend to follow a familiar theme by using an aggressive-looking stand and some RGB lighting, yet given the price point, we were hoping the Predator X27 would deliver a little more refinement. That unfortunately isn't the case, as Acer's chassis is far from the sleekest around; the bezels are somewhat thick by today's standards, and if you like to keep clutter to a minimum, you might be disappointed to learn that there's no internal power supply - a chunky 180W brick is included in the bundle. The design isn't unpleasant; however it doesn't feel like a £1,800 piece of kit. The price tag brings with it lofty expectations, and given this is a flagship solution, we're surprised to find that Acer is using an active fan to keep the monitor cool. Installed in the back of the panel, said fan turns on as soon as the monitor receives power, and will keep running for roughly 15 minutes after the PC is shut down. You can clearly hear it, and given that the monitor tends to sit in such close proximity to the user, it's an unexpected annoyance and one that I'm not sure I'd want to live with on a day-to-day basis. It isn't the loudest fan by any stretch, and gamers who tend to wear headphones may never notice it, but during use I've found it be more audible than my PC, which at the very least is disappointing from a design and engineering perspective. It's a lot easier to be critical when the stakes are this high. 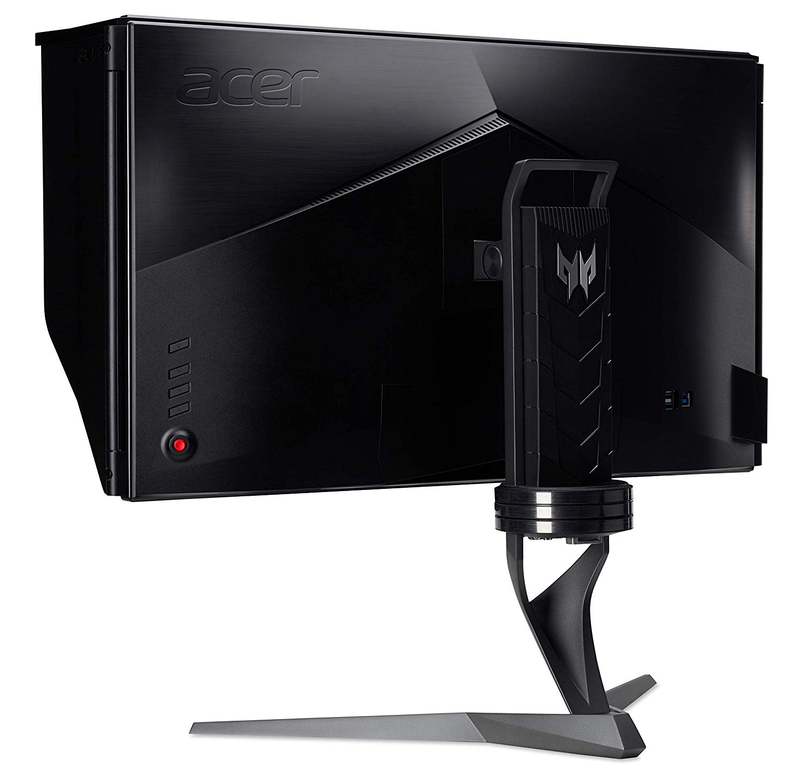 Acer's RGB lighting doesn't offer a whole lot - there's a strip of LEDs on the back of the monitor and another lining the bottom edge - but neither is bright enough to create convincing ambient lighting, and as is the case with an increasing number of new monitors, the integration of RGB illumination feels like a token gesture. 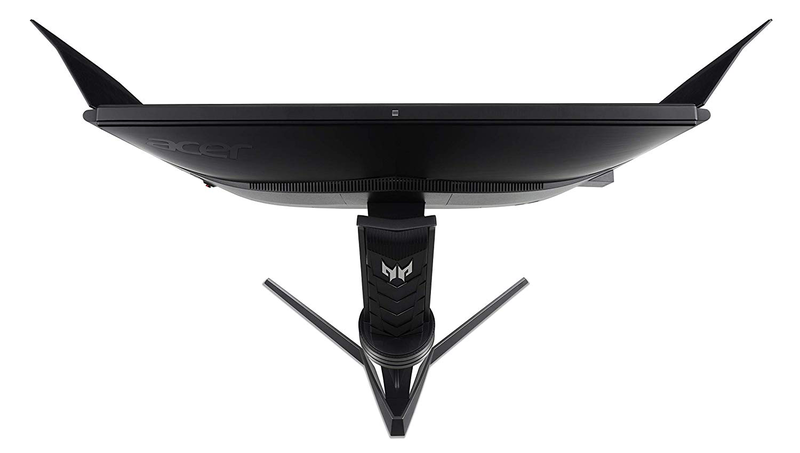 We're starting to see some convergence between monitors and TVs, but Acer views the Predator X27 as a PC solution first and foremost. This is evidenced by the limited number of display inputs, which include just one HDMI 2.0 port and one DisplayPort 1.4. Rounding out the port selection are a headphone jack and four USB ports - two of these line the left side for convenient access - however we aren't keen on the fact that the downstream connector juts out the back. Having it alongside the display and power inputs would have made cable management a whole lot tidier. Elsewhere, a pair of stereo speakers provide basic audio output, and Acer's sleek OSD is navigated by a combination of a rear-mounted joystick and four accompanying buttons. Though we've seen others take the next step in the form of a dedicated Windows control app, the on-screen menus are quick enough to get around. As a sign of Predator's X27 intent, there's also an optional hood included in the box. Attached with a few simple screws, the hood doesn't do anything to improve the monitor's overall elegance - putting it in place adds a boxy, CRT-like quality - but using it does minimise reflection and improve the overall feeling of immersion. 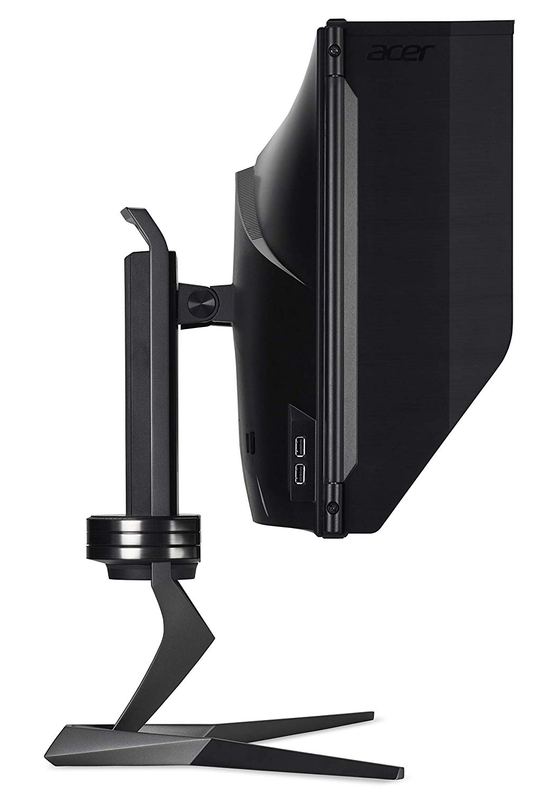 A Vesa mount on the back provides support for a third-party mount, but the default stand should offer ample flexibility for most users. 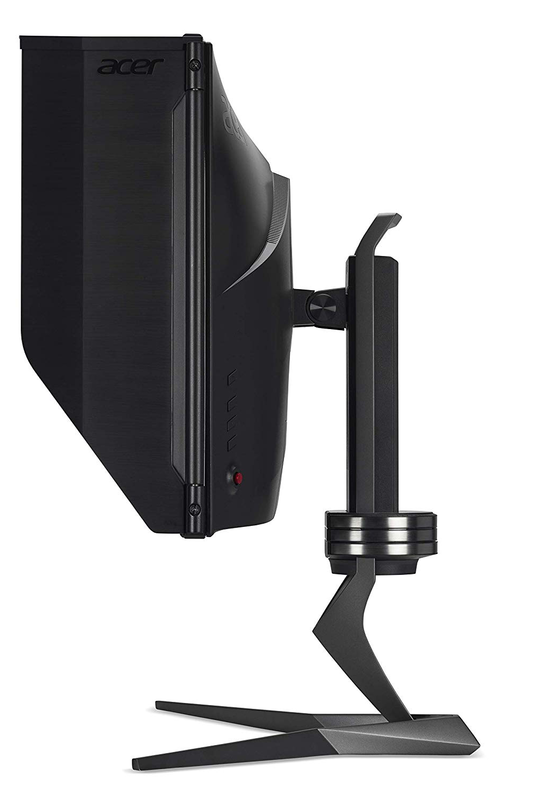 There's -5°/+25° of tilt, 20º swivel, and 130mm height adjustment. All that's missing is portrait mode, though that's hardly call for concern on a gaming monitor. Predator X27 can't do it all, but it can deliver breathtaking gaming visuals. Let's roll the benchmarks.